We never bought a costume when I was a child. As a result, I’ve always loved putting together costumes with items and clothing we already had at home. To this day, I can remember this beautiful, full-length, paisley skirt that I wore quite a few times as a gypsy outfit (and sometimes just to play in). What it was originally purchased for, I haven’t a clue. All I had to do was add a white peasant blouse, big hoop earrings, perhaps a scarf around my head, a few bangles on my wrists, and voila! Hey, it was in the 1970′s. What mom didn’t have a few extra bangles, a scarf and a pair of big hoop earrings that her daughter could borrow? I loved that skirt. I would twirl around and then quickly sit down on the ground so the skirt would swirl and settle in a full circle around me. Golds, browns, creams, and orange surrounded me. I felt like a royal gypsy princess! Other years, I’d grab my dad’s army cap and field jacket, a branch from our backyard, tie a red bandana filled w/pebbles or socks at the end of the branch and go trick-or-treating as a hobo (bum). Oh yes, and wipe some charcoal on my face for a’dirt’ effect. Didn’t cost a cent! As far as trick-or-treat bags go? I believe we always used pillow cases. As I grew older, I put together costumes in college for Halloween Dances and/or Masquerade Dances. Sometimes bits of them were borrowed from roommates. Occasionally, my mom would send me something she picked up at a yard sale. One time she sent a bright pink flapper dress that had black fringe on it! That was a fun costume! Luckily, I already had black high heels and a long pearl necklace to add to it. 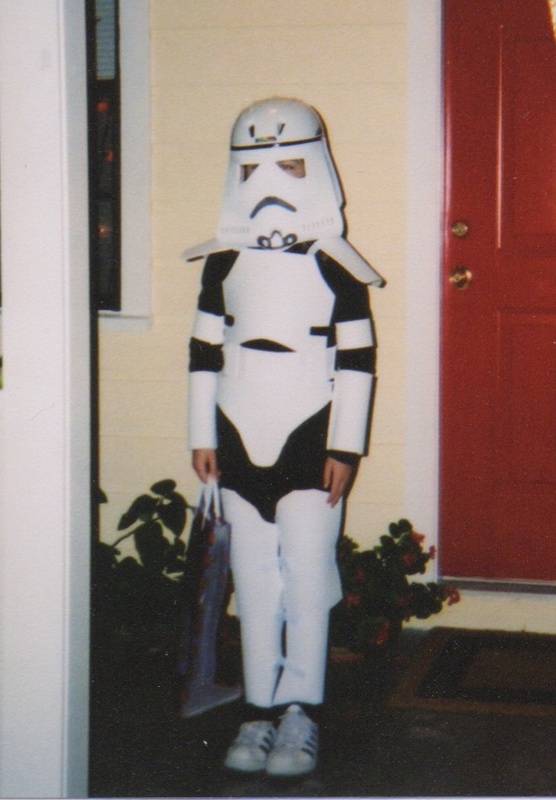 This Storm Trooper costume was good for a few years of trick-or-treating! Years later, I became a mom. That opened up a whole new world of playing dress-up with my son and realizing there weren’t a lot of dress-up, fun clothes for boys in the world. So I pulled out my sewing machine (I’m not a seamstress but I can sew fairly well, just don’t ask me to put in zippers or elastic), bought some fabric, hunted in thrift stores or yard sales, and pulled from my clothing, my husband’s, and my son’s clothing to create various costumes for school projects, Halloween, or just for fun. I Had A Battle Today And Lost – Ouch.